Grace Episcopal Church prints an announcement sheet that is distributed each week with our Sunday worship bulletins. Click on the links below to download the announcement sheet for a particular week. We also have a weekly email newsletter featuring current news and events that is published every Thursday afternoon. If you have any information you would like included in our church publications or if you would like to be added to our distribution list, please contact Communications Coordinator Janis Greenbaum. Get Ready for the Holiday Sale! 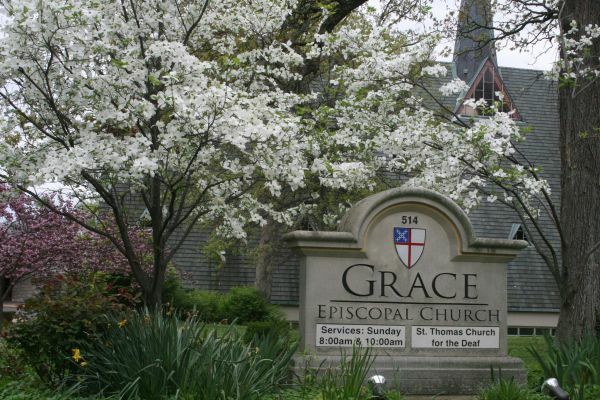 Grace's staff meet each week on Wednesday mornings to discuss and plan parish events and business. The staff will be unavailable during this time, except for pastoral emergencies. This group serves as a beginning level choir for grades 4 though 8, with opportunity for advancement. It meets on Wednesdays, 4:30 to 5:30 p.m. and welcomes both boys and girls. The choir works on music reading and musicianship, with opportunities to play in our Sunday worship services and the annual spring concert at Grace. Contact handbell choir director Ella Heigham for more information. Family Worship: First Sunday of each month at 5 p.m.
Holy Eucharist: Tuesdays at 9:30 a.m. Morning Prayer: Wednesdays at 9:30 a.m.